Buy 24 or more for $9.97 each. Travel to America's inland seas, where beacons of light illuminate paths to romance! Set between 1883 and 1911, seven historical novellas take you to the Great Lakes, where men and women battle the elements to keep the lighthouse lamps burning bright. Their sacrifice ensures sailors' safety, but can they find an antidote to their loneliness? 446 pages, softcover from Barbour. Along the Great Lakes, Americas inland seas, lighthouses played a vital role in the growth of the nation. They shepherded settlers traveling by water to places that had no roads. These beacons of light required constant tending even in remote and often dangerous places. Brave men and women battled the elements and loneliness to keep the lights shining. Their sacrifice kept goods and immigrants moving. Seven romances set between 1883 and 1911 bring hope to these lonely keepers and love to weary hearts. Anna Wilson's plan to be the next lighthouse keeper is endangered when Maksim Ivanov is shipwrecked on Thunder Bay Island. Handsome and capable, he could steal her dream. Or provide a new one. Ava Ryans father has passed, leaving her alone, and ill, to tend the light with nowhere else to go. Logging foreman Benjamin Colfax needs the height of the lighthouse to determine the best cutting route, but he senses something amiss in Ava and her determination to remain reclusive. Can he get her to open up, or will she keep herself locked away? Valerie Fillman's best hope for a future lies on the tiny island that holds her worst memories. Can Paul Sholtus, the new lightkeeper, and his daughter help bring healing? And love? Natalie Brooks loses her past to amnesia, and Cal Waterson, the lighthouse keeper who rescues her, didnt bargain on risking his heartwhen her past might change everything. Lydia Palmer's dream for happiness as a lighthouse keeper's wife shatters when her fianc&eacute; Nathan Drake drowned in a shipwreck, but his brother Jesse survived. Multi-published, award-winning author Lena Nelson Dooley has had her books appear on the CBA and ECPA bestseller lists, as well as some Amazon bestseller lists. She is a member of American Christian Fiction Writers http://www.acfw.com/ and the local chapter, ACFW - DFW. Shes a member of Christian Authors Network, and Gateway Church in Southlake, Texas. Her 2010 release Love Finds You in Golden, New Mexico, won the 2011 Will Rogers Medallion Award for excellence in publishing Western Fiction. Her next series, McKennas Daughters: Maggies Journey appeared on a reviewers Top Ten Books of 2011 list. It also won the 2012 Selah award for Historical Novel. The second, Marys Blessing, was a Selah Award finalist for Romance novel. Catherines Pursuit released in 2013. It was the winner of the NTRWA Carolyn Readers Choice Award, took second place in the CAN Golden Scroll Novel of the Year award, and won the Will Rogers Medallion bronze medallion. Her blog, A Christian Writers World, received the Readers Choice Blog of the Year Award from the Book Club Network. She has experience in screenwriting, acting, directing, and voice-overs. She has been featured in articles in Christian Fiction Online Magazine, ACFW Journal, Charisma Magazine, and Christian Retailing. In addition to her writing, Lena is a frequent speaker at womens groups, writers groups, and at both regional and national conferences. She has spoken in six states and internationally. She is also one of the co-hosts of the Along Came a Writer Blogtalk radio show. Lena has an active web presence on Facebook, Twitter, Goodreads, Linkedin and with her internationally connected blog where she interviews other authors and promotes their books. Rebecca Jepson is a homebody who loves a good book, a cup of freshly ground coffee, and all things autumn. She is the author of A Highbrow Hoodwink, a novella included in the ECPA bestseller, TheLassoed by Marriage RomanceCollection. In addition to writing, she works as a paralegal and volunteers in various ministries at her church. She lives in Reno, Nevada, with her husband, Mike. ECPA-bestselling author Carrie Fancett Pagels, Ph.D., is the award-winning author of over a dozen Christian historical romances. Twenty-five years as a psychologist didn't "cure" her overactive imagination! A self-professed "history geek," she resides with her family in the Historic Triangle of Virginia but grew up as a "Yooper" in Michigans Upper Peninsula. Carrie loves to read, bake, bead, and travel  but not all at the same time! You can connect with her at www.CarrieFancettPagels.com. Pegg Thomas lives on a hobby farm in Northern Michigan with Michael, her husband of mumble years. A life-long history geek, she writes "History with a Touch of Humor." When not working on her latest novel, Pegg can be found in her garden, in her kitchen, with her sheep, at her spinning wheel, or on her trusty old horse, Trooper. See more at PeggThomas.com. Award-winning author Marilyn Turk writes historical fiction usually set on the shoreline of the United States. A lighthouse enthusiast, Marilyn is excited to participate in this collection. She and her husband have traveled to over 100 lighthouses and climbed most of them. In addition, they served as volunteer lighthouse caretakers at Little River Light on an island off the coast of Maine. 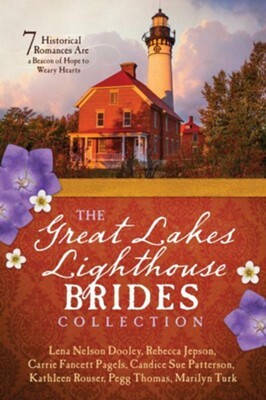 Lighthouses always show up in her books, either as part of the setting or in cameo appearances, and on her lighthouse blog at http://pathwayheart.com. Her book, Lighthouse Devotions, features inspiring true stories about lighthouses. When not climbing or writing about lighthouses, Marilyn enjoys gardening, boating, fishing and tennis. Tell us a little about yourself. I'm Pegg Thomas, one of the seven authors in this collection. What was your motivation behind this project? Born and bred in the great state of Michigan, almost fully surrounded by the Great Lakes, I wanted to showcase them and some of their history in a Barbour historical romance collection. What do you hope folks will gain from this project? I hope readers will enjoy the lovely romances in this collection, but that they will also take away a bit of the majesty and dangers of the Great Lakes. The lighthouses played such an important part in safely guiding sailors across our freshwater inland seas. They helped usher pioneers into new lands and carried out a wealth of raw materials to the mills back east. Without them, our country would not have grown and expanded at the rate it did during the mid-1800s and well into the early 1900s. How were you personally impacted by working on this project? It's always such an honor to work with other Christian authors. This collection was no exception! And writing about the Great Lakes? That was a labor of love.